← Star Wars: The Old Republic for MAC! There’s no question that when attempting to kill a ninja, you must send dozens of untrained and unskilled fighters against him. 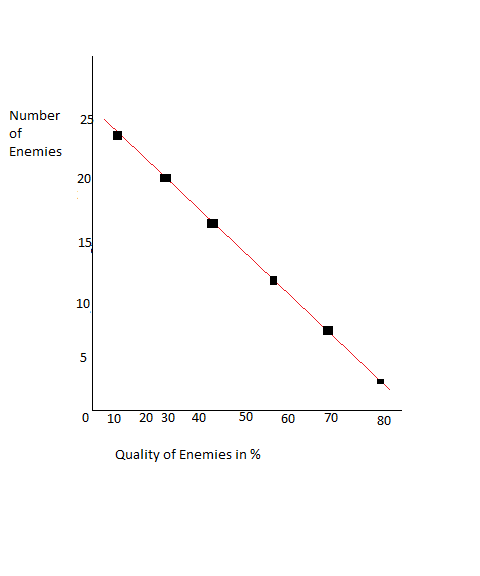 However when doing so, you must take into account the Inverse Ninja Law, in which there is a perfect inverse 1:1 correlation of number of enemies to quality level. See chart A-1. Note that the enemy quality can never reach a full 100%. That’s because they may be able to take out the hero ninjas sidekicks and friends, but would never take out the ninja himself/herself in a fair fight. Even as a young child I was aware of the Inverse Ninja Law and it was present in one of my favorite arcade games of the 80s, Ninja Warriors. What I didn’t notice as a child however, was how racist the game is. In Ninja Warriors, you play as the blue, male ninja codenamed “Ninja” and the red, female ninja codenamed “Kunoichi”. Hundreds of black guys, armed with nothing but a knife, are sent to their deaths in a futile attempt to defeat you. At best, they are simply there to get in the way to give the white guys, who are always armed with guns, a chance of landing a shot. Considering this game is supposed to take place in a distopian America in 1993, this may have been an American Military preliminary test run for “Operation: Get Behind the Darkies”. Got a video to help better illustrate my point. You only need to watch it for about 10 seconds to get the idea. Posted on January 22, 2012, in Not Reviews and tagged arcade, mame, ninja warriors, taito, zuntata. Bookmark the permalink. Leave a comment.